The increased number of codes in ICD-10-CM will make the new coding system much easier to use. As of now just as you do not have to search the entire ICD-9 list for a proper code, you also don’t have to conduct searches of the entire list of ICD-10-CM for the proper code. In APOLLO you should look at the look-up search by name in the ICD-10 section. You would click on the magnifying glass and type in the DX you are looking for in the ICD-10 box. The more words you type in the narrow the search gets and will generate a code or a list of codes that corresponds to the ICD-10 you are looking for. You can also type in the ICD-10 code and it will list all codes with more specificity. Remember you are trying to be a specific as possible. To do this may require more than 1 ICD-10 code. Because ICD-10-CM is much more specific, it is more clinically accurate, and uses a more logical structure. Most physical therapy practices use a relatively small number of diagnosis codes that are generally related to a specific type, so this should make it easier. Keep in mind the 7th character placement. This is probably the biggest change in the ICD-10. You will sometimes need to put a 7th character down. The 7th character comprises of three different letter entries to use: A (Initial Encounter), D (Subsequent encounter) and S (Sequela encounter). Although you would think “A” is for that initial visit and initial visit only this may not be the case. “A” is for an active treatment regime, so you would bill the “A” as seventh character if you were treating this patient on a recent active DX. The “D” is used for the recovery treatment. Most PT’s will be mainly using the “D” in their treatment because the Primary care giver gave the active treatment. Given all of this, when should we use the “S”? According to the AMA ,“S” – Sequela is a chronic or post-residual condition that is a complication of an acute condition that occurs after the acute phase of a disease, illness or injury. Use the File> Information files> Patient files, chose “Select Treatment Lists” pick “ICD-9 ICD-10 codes” and print out report. This will print all current patients with their ICD-9 codes. Now give this to the coder to put the ICD-10 codes down. The list may be big (you may have not put anyone in as in-active), so just put down ICD-10 codes for the patients you think you will see after OCT 1st . Lastly, remember in APOLLO the DX pointer keeps track per the date of entry. 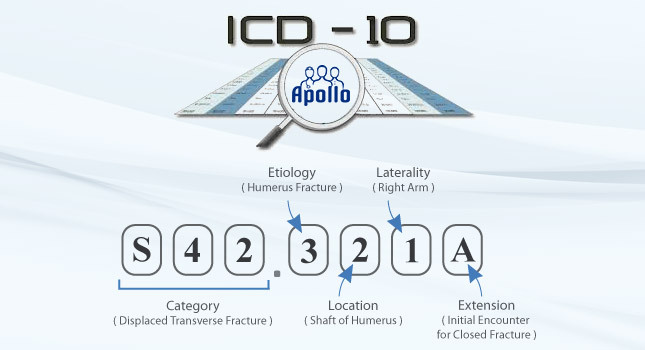 If you only have 1 DX (ICD-9) on Sept 30th “A”, and 2 DX(ICD-10) pointers on Oct 1st “AB”, APOLLO will keep track of this so if you have to re-bill the system will remember how many DX pointers you put down. Please use the Common ICD-9 Codes and their ICD-10 Equivalent next to the ICD-10 for guidance.